“It has been almost a year since my husband left me. His reason: He wasn’t ready to take care and provide for our two children. He didn’t want twins. I didn’t break down when he abandoned me right after I gave birth to my baby girl and boy. But now, when I found out that one of my precious babies has cancer, I have become completely devastated. 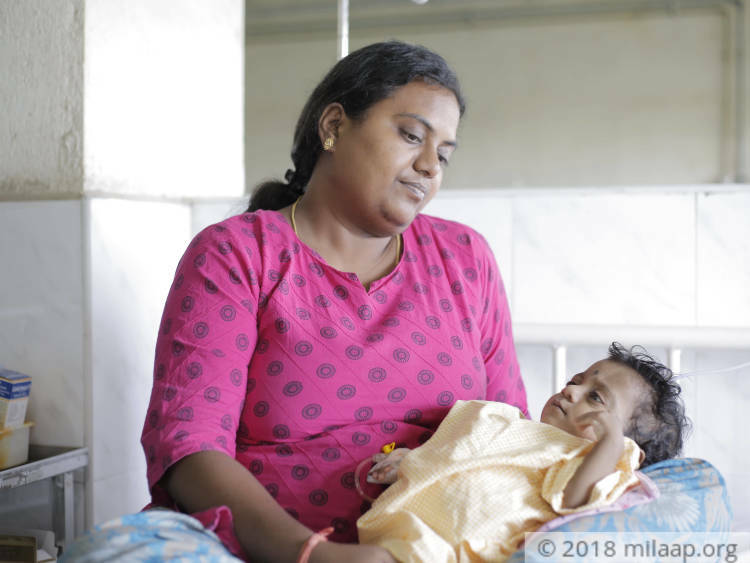 With no job and ageing parents, it is impossible to save my baby boy whose only fault was that he was born to an irresponsible father.”-Kavitha, mother. Kavitha gave birth to a baby boy, Kaveesh and a baby girl, Keerthilakshmi, last year. 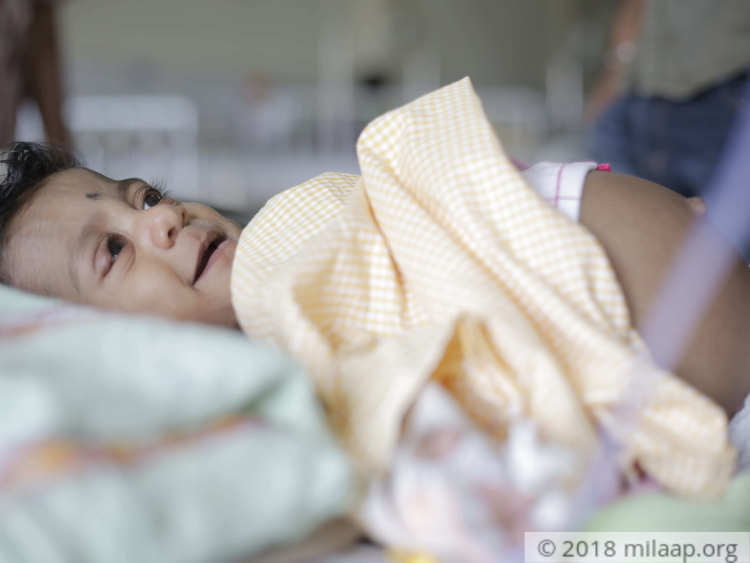 Though they were born premature, they did not have any serious birth complications. 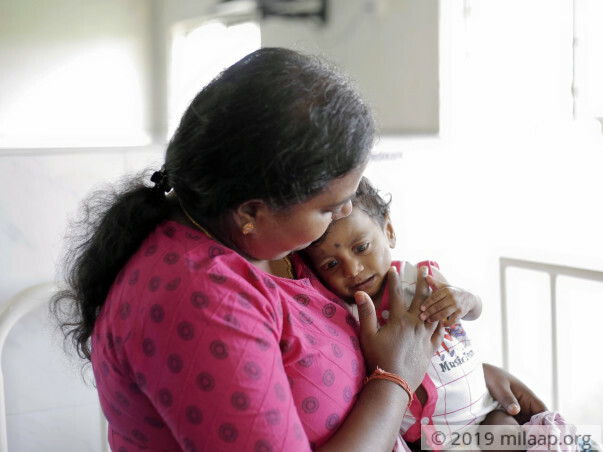 Kavitha was overwhelmed with joy because she had been fighting for them way before they were born; her husband had told her strictly that he would not fend for two children, but her steely motherly resolve triumphed over his apathy. She was determined to give birth and take care of her twins at any cost. “When he left, I was not sad. I immediately moved to my parents’ house in Madurai with my babies. With my father’s help I was able to manage hospital expenses and other requirements. I was determined to find a job soon. That was my plan, but fate had other plans sadly.”-Kavitha. 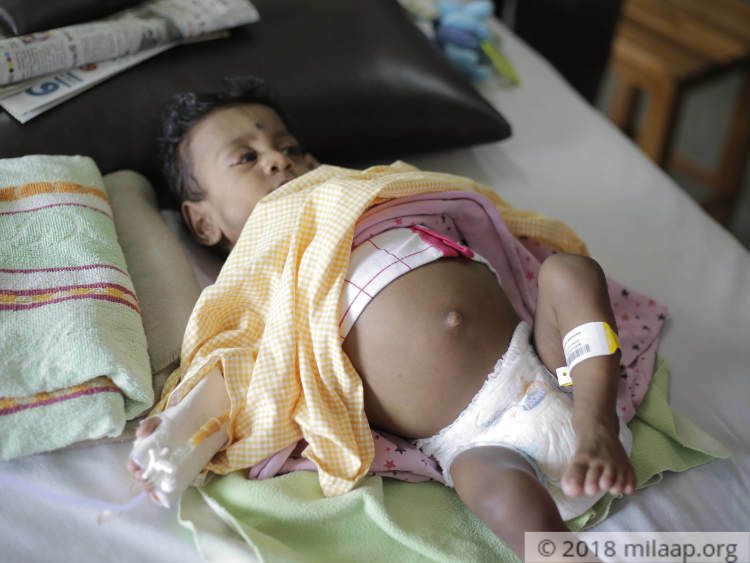 Two months ago, Kavitha noticed that Kaveesh’s tummy looked rather bulged; she became worried and rushed him to a clinic in Madurai. He was told to have a small urinary infection and given some medicines. Days passed, but her baby boy did not get better; instead, the swelling became more prominent. “I could feel a lump on his tummy. I didn’t want to believe that it was serious, but my maternal instincts told me that something was very wrong about my baby boy. I decided to take him to a better hospital in Chennai for a thorough check-up.”-Kavitha. It only took a round of blood tests and scans for doctors in Chennai to tell this unassuming mother that her baby boy has an aggressive and deadly liver tumor. That is why his tummy was so swollen. 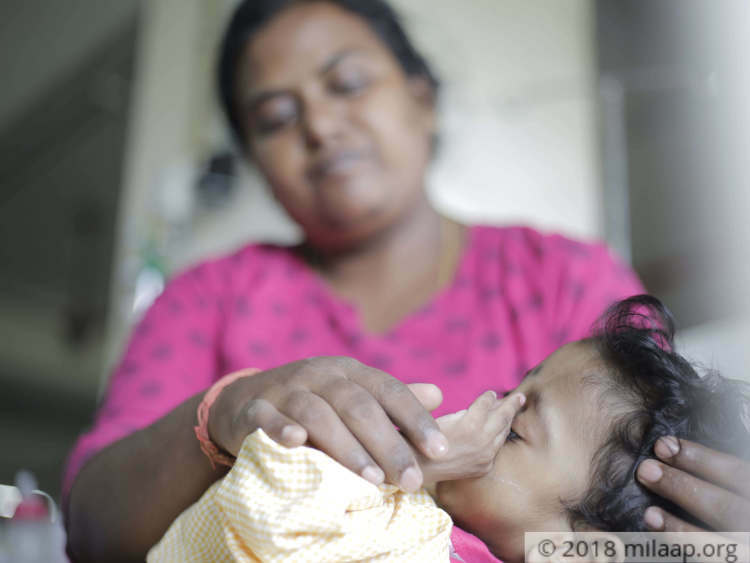 Kavitha took many days to come to terms with reality – her son has a critical condition that can become worse without treatment. “I had been living in a bubble where only my kids and I existed. I was very happy there. Now it has burst. 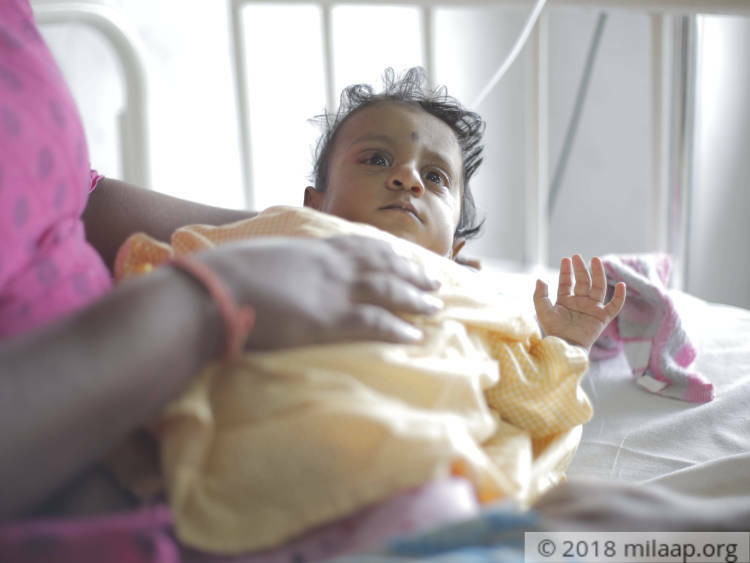 Constantly running to the hospital for check-up and worrying about my child have replaced any joy that I had I am relieved that my baby girl is okay, but when one child is suffering, a mother can never be at peace.”-Kavitha. 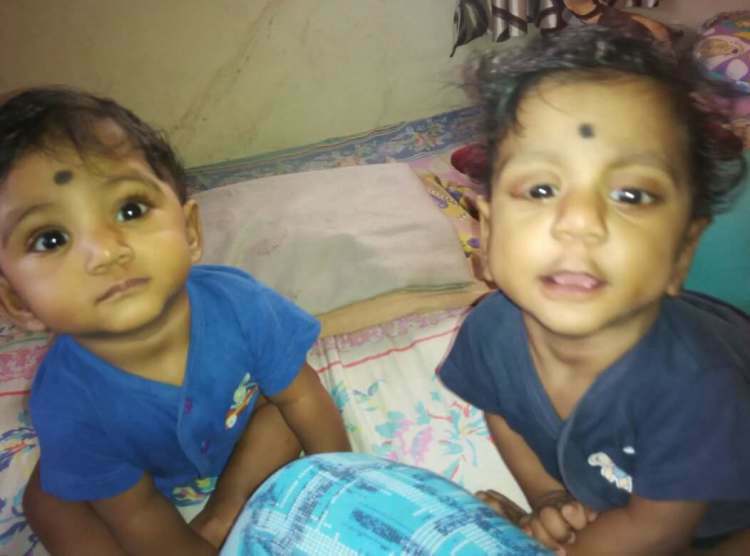 At present, Kavitha, her babies and her aged parents live in a rented room in Avadi, Chennai. She has been attending several job interviews, but nothing has clicked so far. Her father, who is a retired central government employee, is the one who is helping with the household as well as medical expenses now. But his savings are also meager, and will not be enough to save Kaveesh. “My father has been kind to provide for me and the kids after my husband left. But Kaveesh’s medical expenses are only getting higher by the day. My poor father will not be able to help me financially for long. His savings is almost exhausted now. I don’t think I will be able to find a job right in time to save my son. Please help me.”-Kavitha. “He was supposed to be happy and healthy like his sister – who has started sitting up and is doing well with her developmental milestones. She sleeps soundly at night but Kaveesh fills the room with his cries of pain. He also gets frequent fevers and is ill all the time. I want to save my poor baby at any cost.”-Kavitha, with tears in her eyes. Baby Kaveesh needs to undergo 6 cycles of chemotherapy to fight his tumor that is getting more aggressive by the minute. Kavitha’s father has somehow managed to pay for 1 cycle of chemotherapy so far. The elderly gentleman has exhausted all his savings for his grandson, but that is not enough to save him. Without urgent help, Baby Kaveesh will succumb to his deadly tumor. Kavitha has sacrificed a lot and gone through hell to save her baby, but she has no hope left. Kaveesh is doing well. He underwent tumor excision with prolonged hospital stay. His refractory tumor has not responded for 2 chemotherapy regimes. Hence he needs to undergo 3 more cycles of Chemotherapy. We shall keep you posted. Here's an quick update Kaveesh. He is currently in the hospital and is doing ok. We have planned to do an embolisation followed by a extreme resection which can be done only by pediatric liver transplant team and interventional radiologist in RIMC. 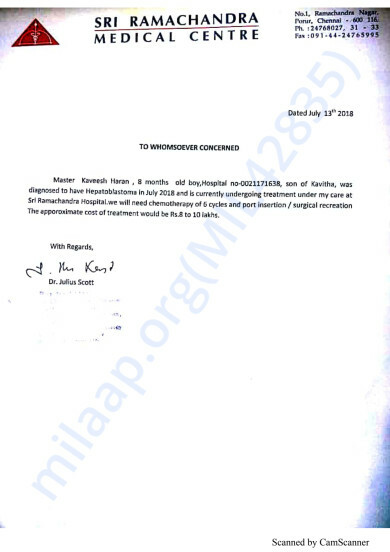 Post this, liver transplant will be decided. Here's a quick update on Kaveesh. Kaveesh has successfully undergone 4 cycles of Chemotherapy. His health has not improved yet. He is prescribed a liver transplant now under Prof. Dr. Mohd Rela. The transplant will have to happen in the next 3 weeks. Will keep you posted.